Are you facing the challenge of moving to a new home and trying to decide what design style you would like? You ask yourself, do I like Traditional, Modern, Coastal, or French country? There are seemingly endless options and you are just not sure how to choose what will make your new space feel like home. Maybe there are things you just have to keep, and aren't sure how to incorporate them into your new home. Rest assured you are not alone these design challenges are faced by most people when they move. However there are a few tricks that can help you not only choose your new style but that will also help you to execute your design plan. Here are some tips I recommend to my clients who haven't identified there "design personality". If possible even before you purchase your new home narrowing down your personal tastes will help you execute the best design plan. For example if you are modern and you select a very traditional home, it is going to be much more difficult and expensive to accomplish a modern interior. So how then do you figure what that perfect design is? A great place to start is by creating a design scrap book. This can be accomplished a few ways. If you are a virtual person then the internet offers an endless amount of images to choose from. 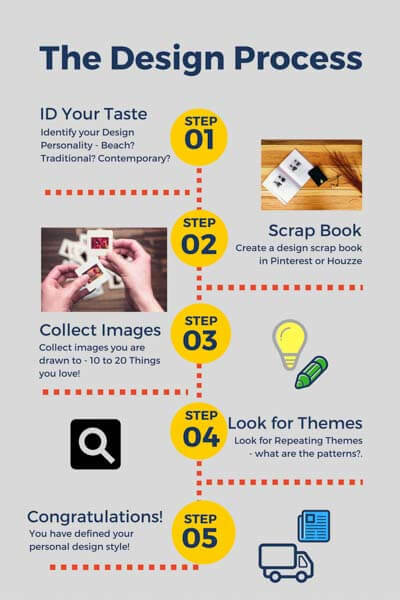 Websites such as Houzze and Pinterest are great resources to start a virtual scrapbook of design ideas. You can also use magazines if you are more tactile. To begin, start to collect images you are drawn to and add a personal comment to each photo. For example: I like the mood of this room, the color scheme, or I love that sofa! Don't over think each image, use your first response. If you are immediately drawn to something that is a good sign you will love it for a long time! After you have collected 10 to 20 images then stop and review them. Look for what they have in common. You will normally see a pattern that represents your personal design style. Congratulations!! If you can see the repeating themes in your photos you collected you have just interpreted your own personal design style! This new scrapbook will help you begin decorating your new interior. If you will be using an interior designer it is also an invaluable tool for them transform your style into your new home. So how then, you ask, do I incorporate the things I already own in to my new style, that will be the subject of our next blog.